The global thermoform packaging market is highly consolidated in nature with the presence of a few players holding a massive share of the market, states a research study by Transparency Market Research. The leading players in the global market, namely Amcor Limited, Bemis Company, Inc., and Sonoco Products Company are anticipated to account for a key share of the market in the forecast period. In order to enhance their market presence and interest a large number of consumers, the key players in the market are emphasizing on the expansion of the product portfolio. This is likely to help the players in fulfilling the rising demand from the medical and pharmaceutical packaging sectors in the near future. In addition, the development of new and innovative techniques to improve 3D modeling techniques, rapid prototyping, and visual product rendering is expected to benefit the leading players in the next few years. According to the research study by Transparency Market Research, in 2016, the global market for thermoform packaging was worth US$36.4 bn and is likely to reach a value of US$57.6 bn by the end of 2024. This market is anticipated to exhibit a healthy 5.90% CAGR between 2016 and 2024. 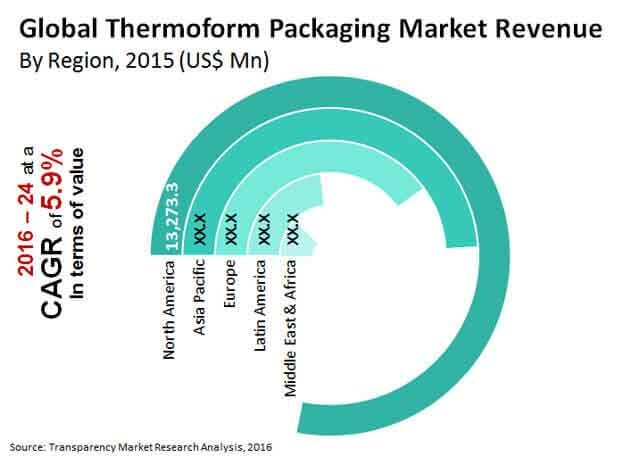 From a geographical viewpoint, a key share of the global thermoform packaging market was held by North America in the last few years. As per the research study, this region is anticipated to remain in the leading position in the forecast period. The high growth of this region can be attributed to the presence of a large number of retail brands, which are estimated to contribute extensively towards the development of the North America market in the near future. On the flip side, the Asia Pacific market is likely to register an impressive growth in the next few years, thanks to the rising demand for food service industry, changing lifestyle, and the growing disposable income of consumers, especially in developing nations of Asia Pacific. On the basis of packaging type, the blister packaging segment is expected to lead the global thermoform packaging market in the forecast period. The increasing use of blister packaging, especially in the pharmaceutical sector in order to reduce the chances of product contamination is one of the key factors anticipated to encourage the growth of this segment in the next few years. In addition, the rising number of applications of blister packaging is expected to accelerate the growth of the segment in the forecast period. The tremendously rising demand from the food and beverages industry is one of the key factors estimated to encourage the growth of the global thermoform packaging market in the next few years. In addition, the rising preference of manufacturers for thermoform packaging in the pharmaceutical sector is likely to accelerate the growth of the overall market in the forecast period. The reduced packaging waste and the cost-effectiveness offered by the products is another major factor supplement the market’s growth in the near future. On the flip side, thermoform is not suitable for packaging of heavy items, which is likely to restrict the growth of the global thermoform packaging market in the next few years. Moreover, the stringent rules and regulations concerning the use of thermoform packaging are expected to hamper the market’s growth in the near future. Nevertheless, the increasing investments in the research and development activities are likely to offer promising growth opportunities in the near future. The untapped markets in the developing economies are predicted to supplement the development of the global thermoform packaging market in the near future.